I’m also going to try to go this entire post without making a pun about pho. I will say that I have pronounced it incorrectly all my life. It is not “foe.” It does not rhyme with hello, Rimbaud, or dynamo. It is pronounced “fuh,” as in, “I pho-cking love pho,” and there are actually multiple dialects in Vietnam that pronounce it slightly differently. This site has a pretty detailed run-down. The more you know. 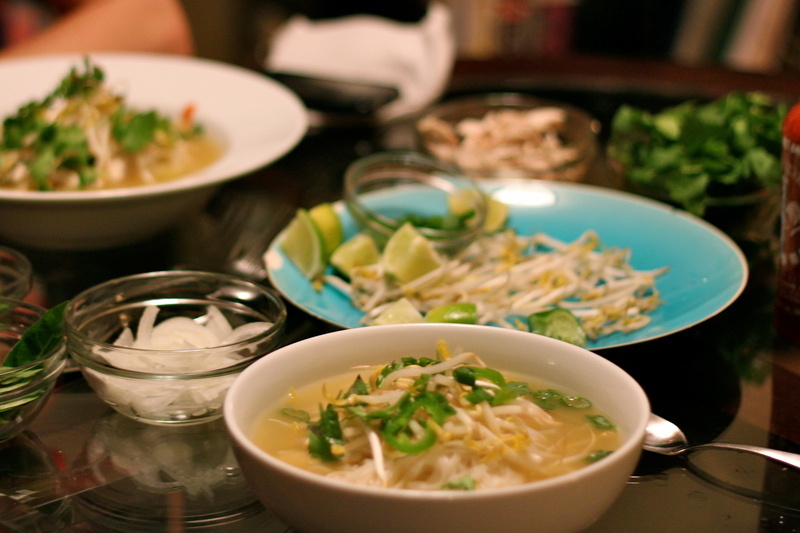 Pho is one of my favorite soups, if not my absolute favorite. A big, hearty bowl of rich, slightly sweet broth filled with tender rice noodles and topped with all manner of fresh herbs, bean sprouts, and hot chili sauce. 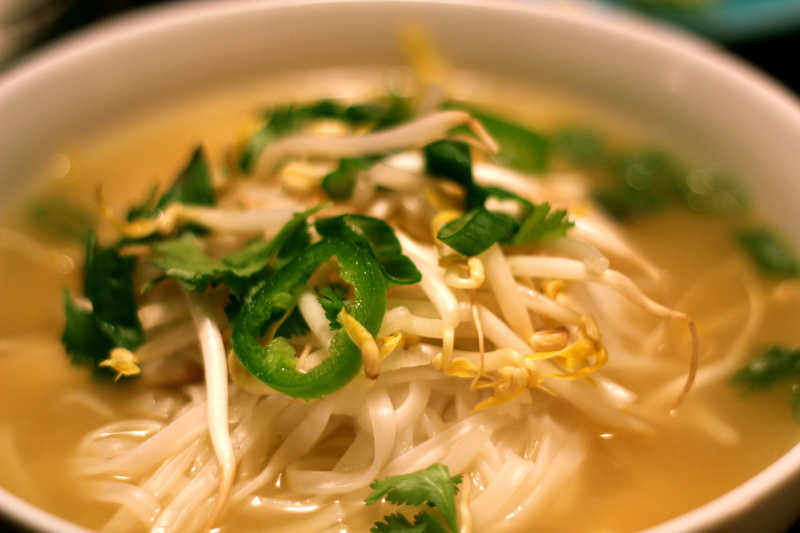 Forget chicken soup — pho will feed your soul. My favorite part is the texture: rich broth, chewy tofu, and slurpably (well, it’s a word now) tender noodles combined with the cold crunch of the bean sprouts and basil. It just rings all the right bells. This was Ryan's bowl...hence the chicken. Of course, if you would like to throw in your favorite meat, by all means, just substitute it for the tofu. Keep it on the plain side so it doesn't compete with the broth. I love “pho bo,” which has beef, and Ryan loves “pho ga,” which has chicken. Of course, this week I’m still not eating meat and so I topped my bowl with baked & sliced tofu. It is totally up to you. Traditionally the broth is made from the bones of the animal of your choice, which gives it an unparalleled richness, but I found this recipe and was inspired to try a vegetarian version. If you’re not already making your own stock, it may make all the difference here. One last tip: careful when adding hot sauce to your bowl. That stuff dissolves into the broth, making your last spoonful from the bottom of the bowl a dangerous endeavor. Proceed with caution, and Happy Slurping! Note: I saved some time and just bought pre-baked tofu at the store instead of making it. If you would like to make it, use extra-firm tofu and brush a slab or two (about 8 oz total) with soy sauce. Bake on a greased baking sheet at 350°F for about 25-30 minutes, flipping once. You don’t need to marinate it first, although of course you could. The tofu doesn’t need to be strongly flavored because you don’t want it to compete with the broth. In this case, it’s not going to make much difference if you make it or buy it. I really do recommend making your own stock, though, if you have the time. But if you don’t, and you have a favorite brand of unsalted veggie broth, by all means give it a try–it will still save you time and it’s in fact what Sally & Lynn recommend (they call it “Cheater’s Homemade Broth” — love them). 1. Preheat your oven to 400°F. Line your baking sheet with foil and arrange the onion, ginger, and garlic in a single layer. Bake for about ten minutes, until the edges are crispy and they char a bit. Keep an eye out so they don’t burn. 2. Meanwhile, put the rest of the spices in a large pot and dry roast them over medium heat, stirring to prevent burning. Once they smell fragrant (about three minutes), add the stock, soy sauce, carrots, and the charred onion, ginger, and garlic. Bring to a boil, then reduce the heat and simmer, covered, for about 30 minutes more. Remove from the heat, strain, and keep warm until ready to use. 3. Cook the noodles by placing them in a large bowl and covering them with hot water. Cover the bowl with a lid or a plate and let it sit for 10-15 minutes or so, until the noodles are just tender. Halfway through, give the noodles a brief stir with a fork to break up any that are sticking together (you don’t have to get every clump, just the big ones). Drain and set aside until ready to use. 4. 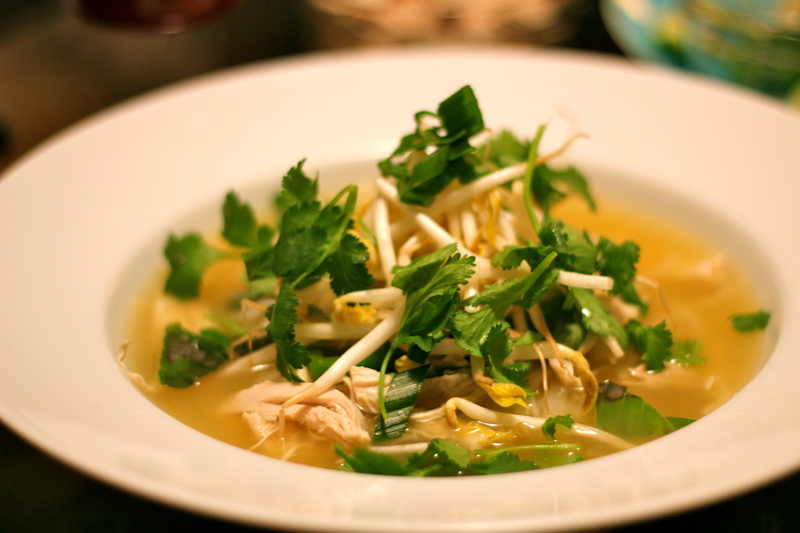 Set the table with a big plate of bean sprouts, lime, basil, cilantro, jalepeno, and onions. 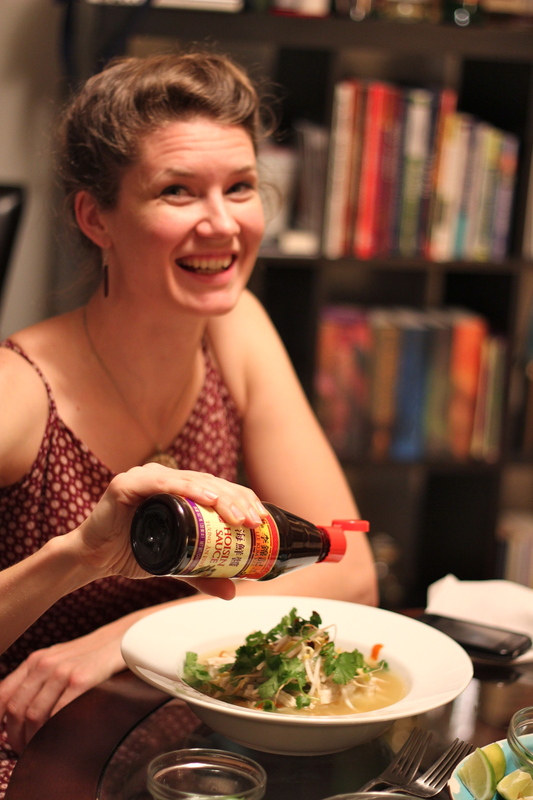 Sriracha and hoisin sauce should be within reach, as well. 5. Divide the noodles between two bowls. Top with tofu. Ladle hot broth over the top. Each diner can add garnishes as she or he desires. that is exactly what it tastes like (in a very good way!!). thanks for saying so! SOLD. I’m on board. Just what I need to clear my sinuses. Also: I’m probably going to keep saying it wrong. That’s not a promise, just a prediction.